This is to be sung to the tune of ‘Still Alive‘ by Jonathan Coulton. I will post a recording, and probably a video, some time in the next few days. We’re sending a beam through CMS. Can’t wait to see some novel interactions. and he’ll sound better than this. Tell the crackpots they’re all still alive. it will go all the way through. now you’ve seen that you’re all still alive. We’ll find the Higgs boson. We’ll find that the answer’s forty-two. Maybe we can even find the question. We’ll blow up the planet. let’s try to make it collide. when I look up there I think I see a mu-mu. In the meantime the DAQ’s still online. And believe me we are still online. Because those show-offs had beam all the time. I forgot to post it earlier. I’ve made a new ‘Wordle’ category so you can easily get to the previous word cloud. an error-checking code in every byte. We find a space in meatspace we can meet. for you I know by words and not by sight. to speak the words I only know to write. I go back in my shell for one more year. but still can’t find the words to match your pace. They’re crushed in scattered pauses far too tight. but when they’re aimed at me I flee in fright. and go back to my home for one more year. I know your mouth just speaks, it doesn’t bite. It doesn’t matter if it isn’t right. so why not flap my tongue and flap my wings? I’ll still be in this cage for one more year. Between March 21 and 27, 1984, theorists, experimentalists, accelerator physicists, and experts in superconducting magnets gathered for a workshop in Lausanne and Geneva. They were not there to discuss the Large Electron Positron collider, for which excavation of a 27km near-circular tunnel would soon begin at CERN, the European Organization for Nuclear Research. They had come to discuss a possible playmate for the LEP, a collider of protons and perhaps antiprotons to be installed alongside the LEP in the same tunnel. Some nicknamed it the Juratron, after the Jura mountains under which part of it would pass. Officially, it was known as the Large Hadron Collider, or LHC. The LHC would accelerate protons to an energy of up to 9 TeV, more than nine million times the energy of a proton at rest. 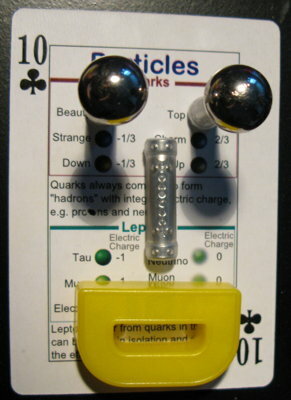 To keep such high energy particles on course in a ring as small as the LEP, the LHC would need superconducting magnets with a magnetic field of 10 Tesla, about 2000 times the strength of a refrigerator magnet (pictured.) The superconductor technology available at the time could theoretically be extended to create magnetic fields of up to 6 or 7 Tesla, but substantial new developments would be necessary to reach the required 10 Tesla. Carlo Rubbia concluded the workshop with the statement, “Perhaps the time has come for us to pause, at least until the magnet, accelerator, and detector issues have made some significant progress.” There would be no playmate for LEP just yet, but it would come. The LEP tunnel was made big enough to fit two accelerators. By the end of 1986, only half a kilometre of it remained to be dug. A preliminary technical study on the possibility of building the LHC on top of the LEP was carried out, and it seemed like a better deal than the alternative proposition of a 1 TeV linear electron-positron collider. With the LHC and LEP together, electron-positron collisions, electron-proton and proton-proton collisions would all be possible, with protons injected by CERN’s existing proton accelerators. Nobody had managed to make strong enough superconducting magnets yet, but there was optimism that it was possible. In 1987, the first LEP magnet was installed in the newly-completed tunnel, and the first model of an LHC dipole magnet was made. To save space and money, the two opposing proton beams would pass through separate channels within the same magnet. Studies were underway of the possibilty of using either niobium-titanium or niobium-tin for the magnets, or perhaps the recently developed ‘high temperature’ superconductors. The next year, a niobium-titanium superconducting magnet was made which could provide a magnetic field of more than 9 Tesla. It was hoped that the LHC would be able to reach an energy comparable to the 20 TeV of the Superconducting Super Collider being built in Texas. In the early afternoon of Bastille day 1989, physicists were jublilant to see the evidence of the first beam of positrons sent around the LEP: an unassuming white oval on a blue screen. But for all the eyes fixed on the LEP, more than ever were looking forward to its companion, the LHC. Many studies were carried out on the feasibility of the superconducting magnets, cryogenics, and civil engineering that would be required. All confirmed that such a machine could indeed be constructed. Two models of LHC dipole magnets in niobium titanium, and one in niobium-tin, both produced fields of around 9.4 Tesla. A cost estimation and construction schedule for the LHC were established: it could be put into service by 1998, while only slightly disturbing the functioning of the LEP. In 1990, more detailed plans of the LHC were prepared, and delegates from CERN member states proposed the idea to their respective states, expecting a decision by 1992. A timely decision would mean that the LHC could start operations in 1998, as predicted, for a cost comparable to that of the LEP. With 9 metre magnets creating a field of 10 Tesla, it would collide two beams of protons with an energy of up to 7.7 TeV each. Four prototype 1 metre long 10 Tesla dipole magnets were ordered from four different companies. A life-sized prototype was constructed, with a field strength of 7.5 Tesla. On 20 December, 1991, the CERN council unanimously approved the LHC project. By that time, thousands of hours of on supercomputers had been spent simulating the interactions that would occur in the LHC. The council asked that all technical and financial details be worked out by 1993. Although the required 10 Tesla field had already been achieved, it was considered too difficult to maintain. Therefore the decision was taken to elongate the dipole magnets to 13.5 metres by deplacing other elements. This would increase the time that the protons were exposed to the field, lowering the necessary field strength to 9.5 Tesla. In 1993, two of the proposed experiments, CMS and ATLAS were approved, along with a new proposition, ALICE (A Large Ion Collider Experiment.) In December 1993, exactly two years after the council’s approval of the LHC, the requested information was presented. Construction could soon begin. Sorry, I didn’t get time to write a Thing this week, because I was secretly somehow involved in the anonymous collaboration which created this video, a song based on Don’t Stop by Sarah Bettens with assorted advice for people working at CERN. Luckily, it features a king of clubs, so guess what… since I’m past the middle of the project, I’m counting down from kings to aces from now on. You can download the video in Quicktime format, an mp3 of the song, the slideshow used to make the video, and the lyrics here. So now you know why I was taking photos of a rubber duck back in April. I took the photo of it with the king of clubs, in the hope that it would earn me a week off.